The choice of what scale to use on your charts makes a big difference to how trend lines sit. Which scale is correct? 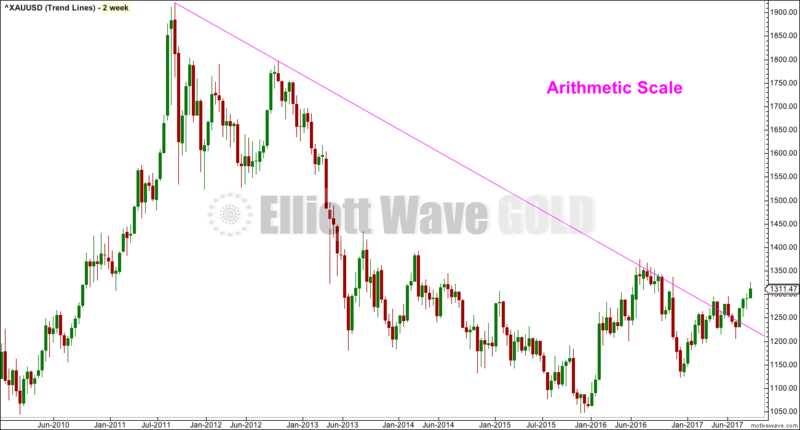 The chart above shows Gold 2 weekly on an arithmetic scale. Notice the bear market trend line has been breached, but did not show where price exactly found support and resistance in the process. 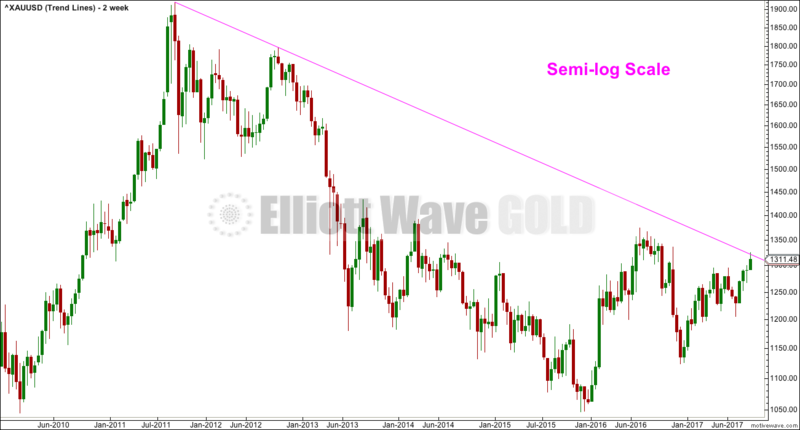 The chart above shows Gold 2 weekly on a semi-logarithmic scale. So far price remains below the bear market trend line. An arithmetic scale is best used for short term price movements. But for long term movements a semi-logarithmic scale is more correct, particularly for markets like Gold which can exhibit blow off tops and selling climaxes. Any long term movement a year or more should always use a semi-logarithmic or ratio scale. “Arithmetic scaling is not a good choice for long-term price movements, since a rise from 2 to 4 represents a doubling of the price, whereas a rise from 20 to 22 represents only a 10 percent increase… For this reason long term price movements should be plotted on a ratio or logarithmic scale. The choice of scale does not materially affect daily charts, in which price movements are relatively small in a proportionate sense. For periods over 1 year, in which the fluctuations are much larger, I always prefer to use a ratio scale”. Published @ 04:28 p.m. EST. This one is easy (at least, I think it is and I’ve really tried to make it easy). There is one mistake in the triangle (just one!) and one mistake in the impulse. Name the rules which I have deliberately broken here. Answers will be posted in comments tomorrow or the day after. 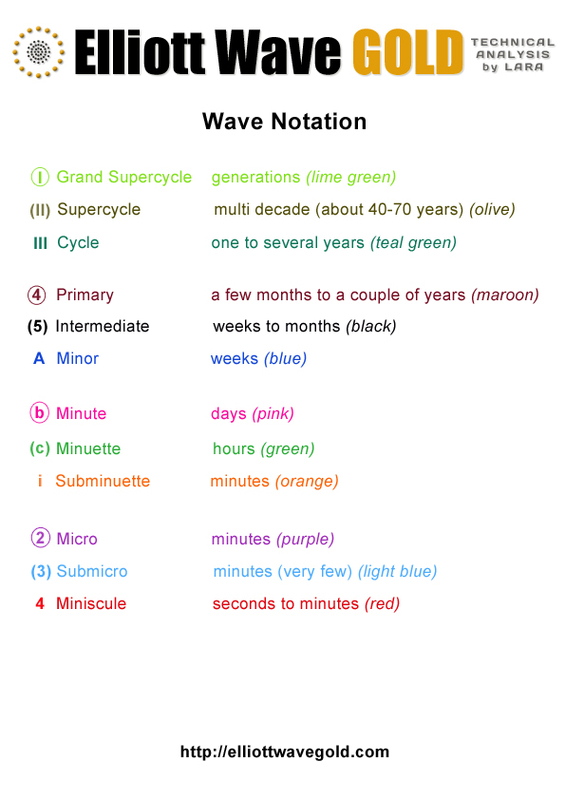 Note: During the process of preparing this post, I found a solution that fixes my main problem with the current alternate wave count. 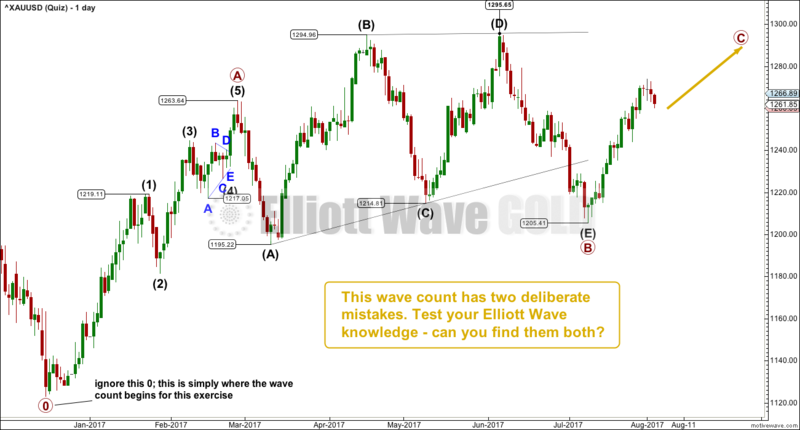 This solution will be published in tomorrow’s Gold analysis. Published @ 05:49 a.m. EST. Volume analysis is essential to a full technical analysis. One of the simplest techniques is to look at volume during a consolidation and note which days, upwards or downwards, have strongest volume. 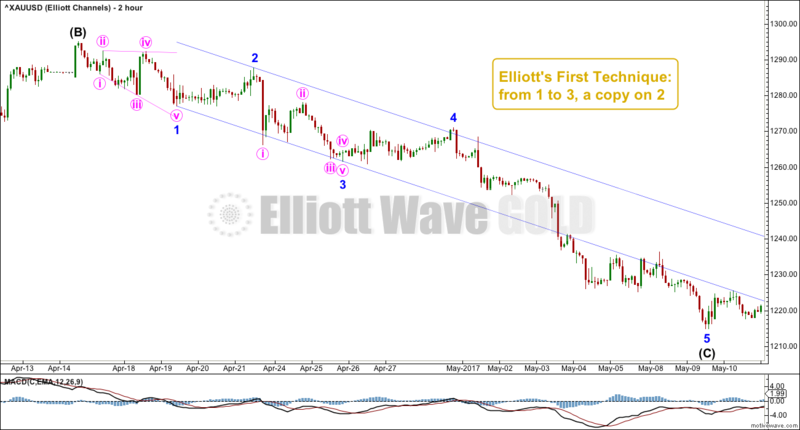 Gold has been within a large consolidation since about January 2017. A small resistance zone is about 1,295 to 1,300. 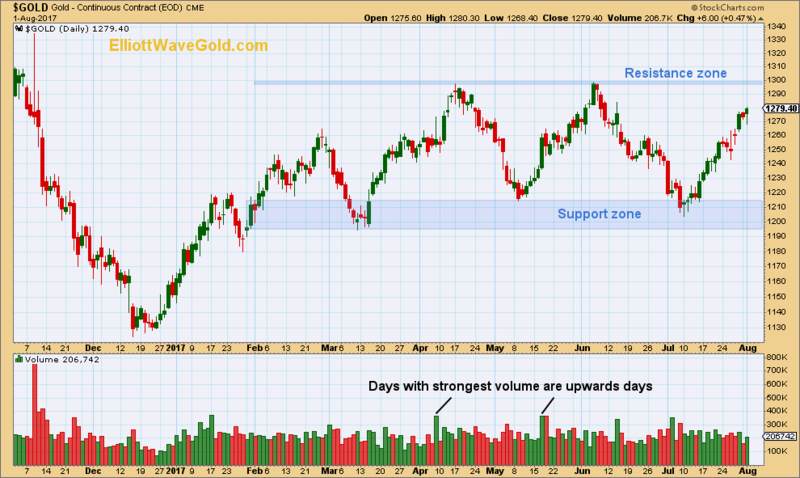 A wide support zone is about 1,195 to 1,215. 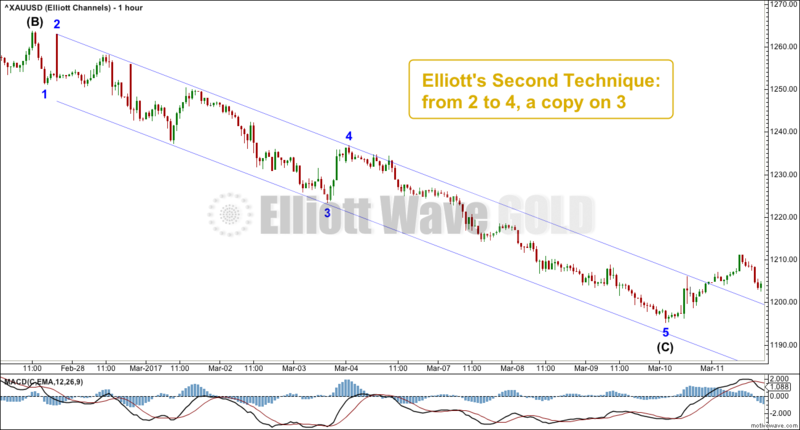 During this period of time, it is two upwards days that have strongest volume and this suggests that an upwards breakout may be more likely than a downwards breakout. This technique does not always work, but it works more often than it fails. This technique is an exercise in probability and not certainty. Published @ 04:00 a.m. EST. To draw a trend line in a bear market draw the line from the high to the first major swing high within the bear market. Extend the line outwards. Assume the bear market remains intact while price remains below the line. 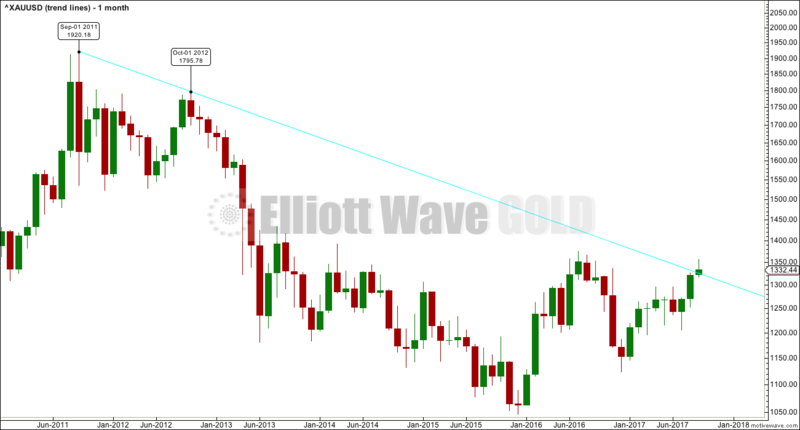 When upwards movement breaks above the trend line, it is an indication of a potential trend change from bear to bull. My definition of a breach is a full candlestick above and not touching the trend line. This chart is on a monthly time frame and indicates that Gold may remain in the larger bear market, which began on September 2011. This analysis is published @ 03:02 a.m. EST on 28th June, 2017. A short, quick downwards wave was expected for Thursday’s session. 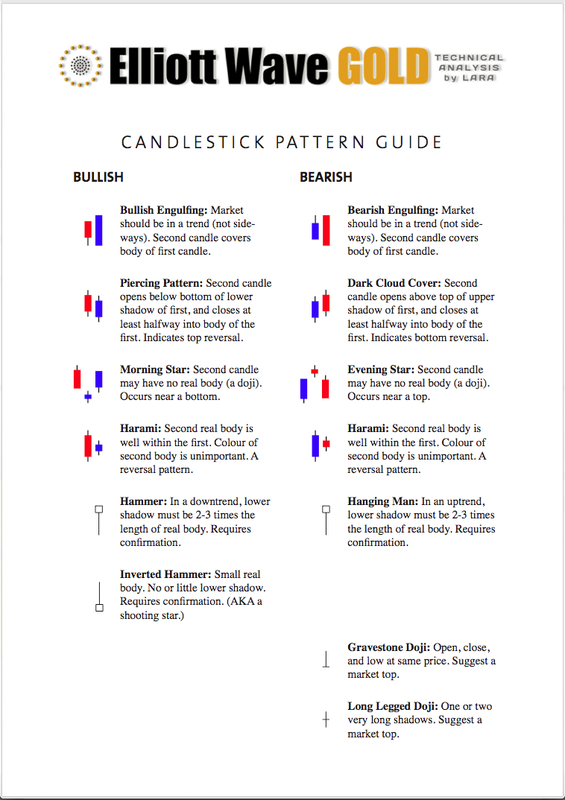 A red daily candlestick fits this expectation. Downwards movement unfolded exactly as expected. 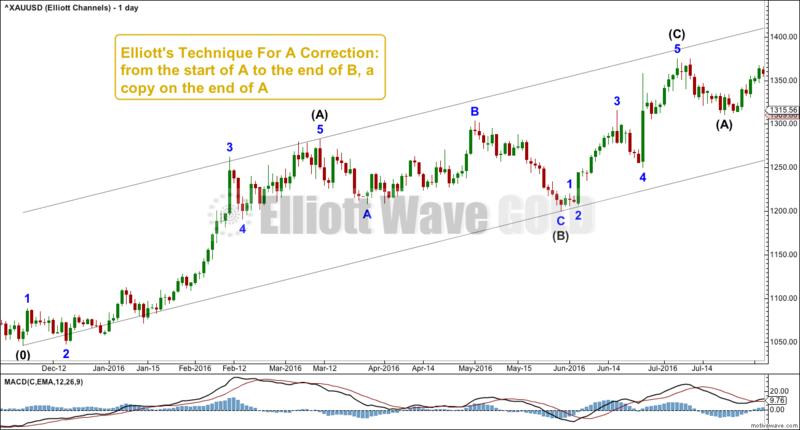 Sideways / downwards movement continued as expected towards the target. 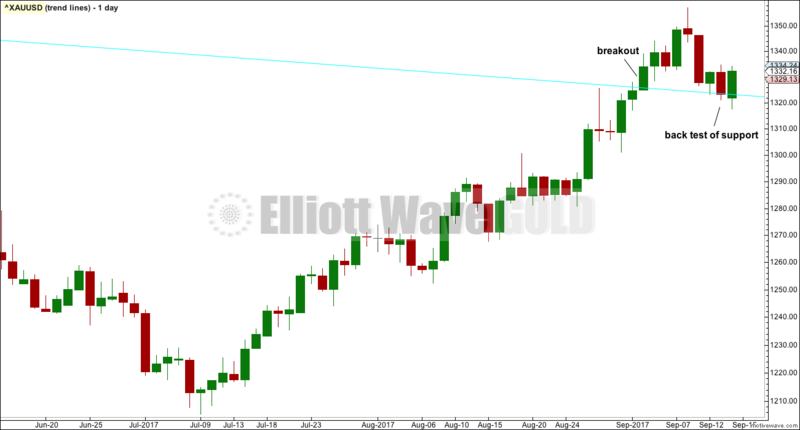 Price has broken out of a consolidation upwards.